This may take the cake as the sweetest news of the day: a group of San Diego’s top-notch chefs will whip up treats this weekend for a special bake sale in Little Italy in support of local charities. The 2019 Chef-Driven Bake Sale – hosted by the San Diego-based nonprofit, Friendly Feast – goes down this Sunday inside the gallery space at Herb & Eatery on Kettner Boulevard in Little Italy. There, a batch of local chefs will sell their creations, hoping to raise money for Friendly Feast and Monarch School, a school in Barrio Logan with a mission to break the cycle of homelessness in the community through education. Can't wait for the biggest pastry party of the year. Grab your tickets and join us at @herbandeatery next Sunday! But the goodies up for sale aren’t your run-of-the-mill pastries. Organizers of the pastry party say the high-end goodies are created by a dozen San Diego chefs from hotspots like Puesto, Trust, Herb & Wood and The Wild Thyme Company. The creations run the gamut from sweet to savory, and cost $5 a pop. 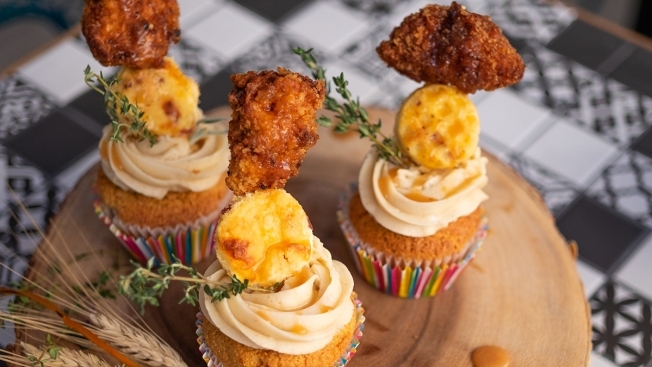 The menu includes items like Chicken & Waffles Cupcakes, Spiced Pecan & Chocolate Tarts, Huckleberry Almond Croissants, and gourmet doughnuts. As of Thursday morning, VIP tickets to the Bake Sale were sold out, but some $10 general admission tickets were still available, as well as some kids tickets for little ones age 12 and under. While perusing the pastries, adult guests can also enjoy a glass of wine grape nectar donated by Domaine Santé. The Chef-Driven Bake Sale begins at 11 a.m. and will likely run until about 1 p.m. – until every treat has been claimed. The Friendly Feast, founded in San Diego in 2017, is a nonprofit organization that produces local culinary events aimed at bringing the community together – in delicious ways – to raise funds for local charities. The events typically feature chefs, farmers, and food producers – anyone who has a hand in elevating San Diego’s scrumptious scene. To learn more about the nonprofit, click here.